Specialized in production of battens for sails, we build custom monolithic not tapered battens, made of glass fibre and epoxy resin. The shape of the battens is rectangular rounded and are especially designed to be used for furling boom systems. We launched on the market our battens for furling boom systems during year 2000. Since that moment, the battens have been demonstrating high quality, high strength and they grant the sail high efficiency. 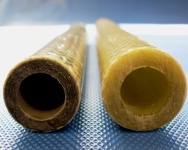 The battens for furling boom systems are available in different thickness and dimensions. Maximum length mt. 18 in single piece. 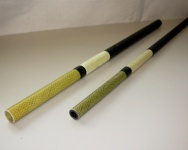 On request of the sailmaker, we can add a carbon fibre reinforcement leech side. This modify keeps the batten section unchanged but increases the stiffness leech side allowing the sailmaker to place the maximum camber where needed to reach maximum efficiency of the sail. 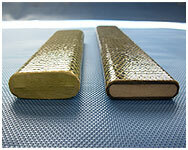 We can supply the batten complete with a Kevlar sheath and thermo-shrinking sheath. These accessories can hold the splinters in the rare case of eventual breaking of the battens, and facilitate the removing of the broken batten from the sail. During the tests made on our 3 mt length battens for furling boom, we reached a torsion of 530° before noticing the first signs of delamination. Both kind of battens are suitable for boats from 40 ft. to 140 ft. and are build in single piece with a maximum length of mt 18. On request we can supply leech endcaps. Specialized in production of battens for sails, we build rectangular tapered leech and full batten made of layers of glass fiber stratified with vinylester resin. 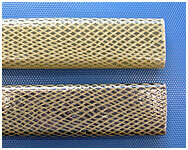 Available standard lengths from mm 600 to mm 3000. 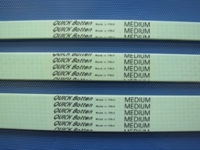 Longer monolithic battens up to mm 6500 will be produced on specific request. Monolithic battens are available in stiffness soft, medium, hard and x-hard and in width mm 20, mm 30 and mm 40. Higher width are available on request. In the nearest future, pultruded battens will be available with a width of mm 10 (thickness inch 0,100, inch 0,140 and inch 0,200), width of mm 15 (thickness inch 0,140, inch 0,200 and inch 0,265) and width of mm 30 (thickness inch 0,350, inch 0,400 and inch 0,500). 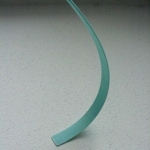 We produce pultruded battens made of glass fibre and epoxy resin. A particular glass fibre tape in the middle of the thickness of the batten, avoids the eventual braking of the tapered part of the batten. Pultruded battens have rectangular shape, are available tapered leech and full batten in the standard length from mm 800 to mm 3000. Longer tapered pultruded battens up to mm 6000 will be produced on specific request. Pultruded not tapered battens are available in various lengths, rolled up in coils with diameter of mt 2,5. At the moment, pultruded battens tapered or not tapered are available with a width of mm 19, with thickness of inch 0,200, inch 0,230, inch 0,265, inch 0,300 and inch 0,350.